So I conscripted my long-suffering husband and we carried it down the street and propped it on the porch to dry out. With one thing and another (mainly the wet summer) I never got round to doing anything with it. These last couple of weeks we’ve been doing battle with the weeds and have managed a stalemate if not a win so I thought it was about time to see if we could rescue our find. It’s not very inspiring but the wood is still fairly sound. The wobble is due both to loose & missing bolts and the supporting braces snapping. First job was to take it apart. I gave all the bolts a good spray with WD40 and surprisingly I was able to remove most very quickly. there were however three that were more tricky and I had to ask for assistance (I did say he was long suffering) One bolt refused to budge and had to be cut off. While I got on with sanding the wooden slats my husband grabbed the opportunity to get out his power tools and he sanded down the metal sides. I’d picked up a couple of cans of black spray paint/rust killer from either Aldi or Lidl last year for this project but hadn’t decided on the colour for the slats. We visited our local Screwfix for replacement bolts and nuts, they had Ronseal Fence Life Plus in stock so we thought we’d try their new colour of Tudor Black Oak. I like using fence paint, it goes on like water, so in the spirit of getting carried away I started painting our garden table. I ran out of time that day to finish it so it still needs a few more coats which I will rectify once Storm Hector is past. 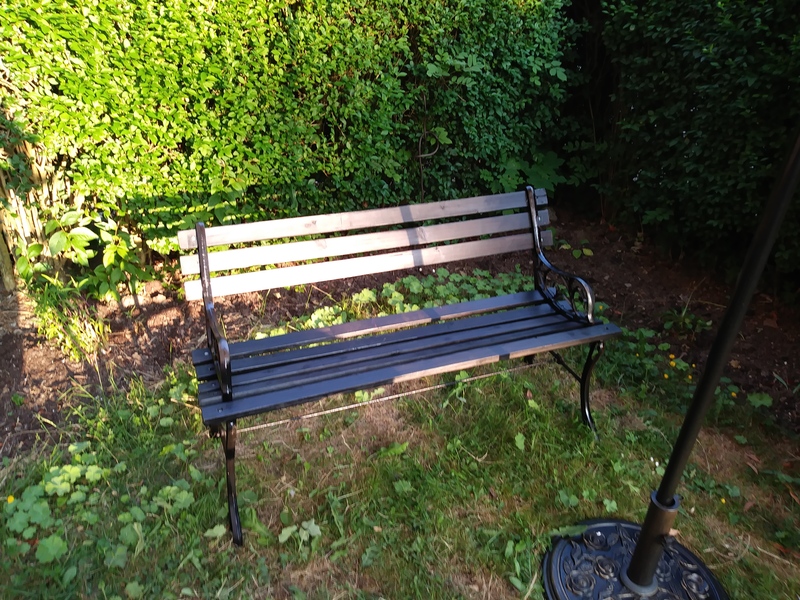 Putting the bench back together was certainly a two person job and after a lot of huffing and only a few cross words we got it back together. It still needs the broken supports replacing so is a little delicate but I intend to get that worked out in the next couple of weeks. Overall I’m really happy with that day’s work.